Some CSS rules need weird "vendor prefixes" to work in certain browsers. Autoprefixer adds these prefixes to CSS rules automatically. Autoprefixer uses the Can I Use database to determine when a rule needs a prefix, based on the browsers you tell it to support. First, make sure you've read Setting Language Options. 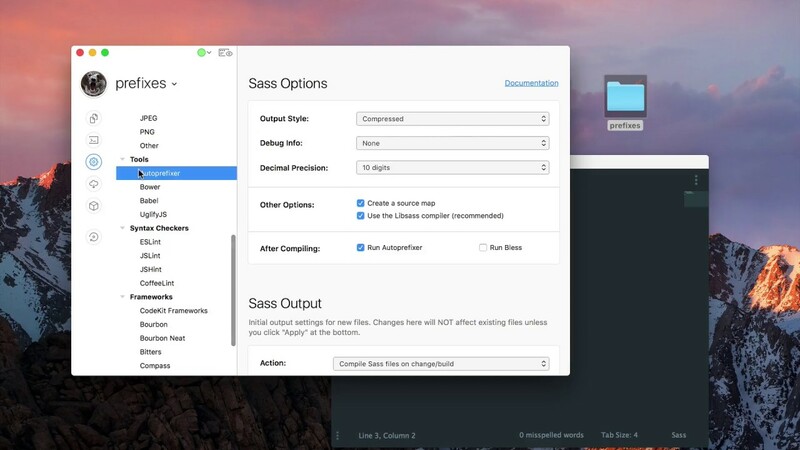 Autoprefixer is available for Sass, Less, Stylus, and regular CSS files. Select one of those files and check the Run Autoprefixer box in the inspector pane. You can also turn on Autoprefixer for all files at once. Open Project Settings, choose one of the languages above, then check the Run Autoprefixer box. Grid statements require Microsoft-specific prefixes to work in certain versions of Internet Explorer. If you need to support those browsers, enable this option.